Construction labor shortages have put pressure on construction pricing and have created a war to retain workers. Construction costs increased 30% again this year. A fact that is both astounding and unbelievable to developers. While recent tariffs have put pressure on raw materials costs, a shortage in construction labor is the chief driver of the rapid increase in construction prices. In some cases, workers have left active job sites to follow more lucrative offers. 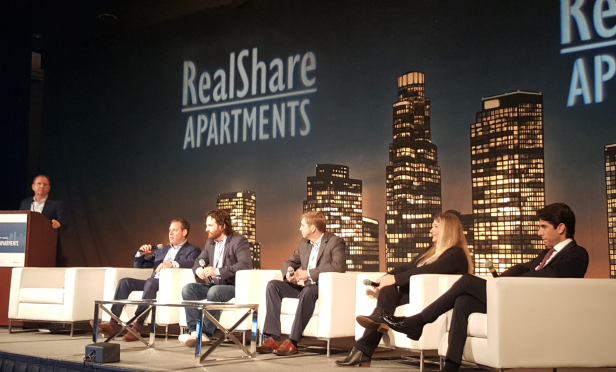 Developers on the Identifying Development & Redevelopment Opportunities in the Middle Market panel at RealShare Apartments this week said that this was one of the biggest challenges. Mike Rovner, president at Mike Rovner Construction moderated the panel, which included Dylan Simon, EVP at Colliers International; Moses Kagan, co-founder and manager at Adaptive Realty; Michael Dowling, senior director at AvalonBay Communities; Kimberly Laten, founder of Color Design Development Group; and James D’Argenio, senior principal of acquisitions at The Bascom Group. Forming strong construction partnerships, paying quickly—within a couple of days of finishing a milestone—and keeping workers busy were among the top ways that developers are keeping construction workers on sites through a deal. “For us, the key is having an excellent construction management partner,” said D’Argenio. “They have critical relationships up and down the supply chain.” Dowling added that speedy payments have been the incentive that has worked for them. “We have been doing everything that we can to pay them as quickly as possible and keep the workers that are performing well,” he said. Kagan said that the payment strategy works well. “We are paying within a day or two of reaching the milestone for a project,” he said.